In a medium bowl, using the back of a fork or a potato masher, gently smash the beans with the lemon juice, oil, and ¼ tsp. each salt and pepper; fold in the dill. 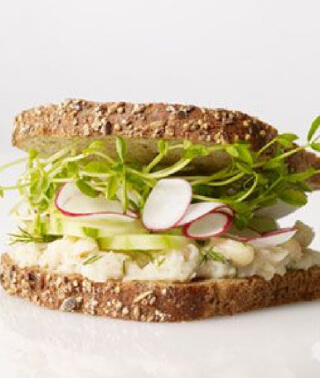 Form sandwiches with the bread, smashed bean mixture, cucumber, radishes and microgreens. What if I change my mind and want to cancel my order? What happens if I don’t pay the balance in time? When will I need to pay for my ordered Homefarm?